I have several reading positions, because if I’m in it for the long haul I don’t want to stay sitting in one chair indefinitely – none of the ones in our flat are comfy enough. If I’m reading an entire book in one sitting (a rare but truly beautiful happenstance these days) I often adopt a lying on my tummy stance for at least part of it, propped up on my elbows. Having done this for a large section of Bossypants on kindle, it turns out my brain is hard wired to turn my head slightly every time I finish a page, as if looking to the next one – because when reading a normal book you obviously have two pages next to one another. You do not have two pages next to one another when reading the kindle, as you are probably aware. In actual fact you only have one, which stays in the same place, by and large. This probably sounds ridiculous, but it took me quite a long while to stop instinctively tilting my head back to the left every time I ‘turned the page’. And that’s another thing I find counter intuitive – not being able to actually turn the page. Oddly enough I think this might be because the kindle reading experience is so carefully designed to be like reading a traditional book. I find that you get immersed in the text in much the same way as you would with a paper book, but the inability to turn the page pulls you back out of that – at least until you get into a rhythm of button pressing, which probably only takes five or ten minutes (depending on whether your subject matter is engrossing, I suppose). This isn’t a problem when reading a book on an iPhone, for instance, because iPhone hasn’t put in all this effort to make you feel as if you’re reading a print book – your brain knows you are basically reading from a computer screen. On a smartphone or PC the background lights up so you can read it in the dark, you often have strange or garish coloured backgrounds or adverts, or other stuff to divert your attention. 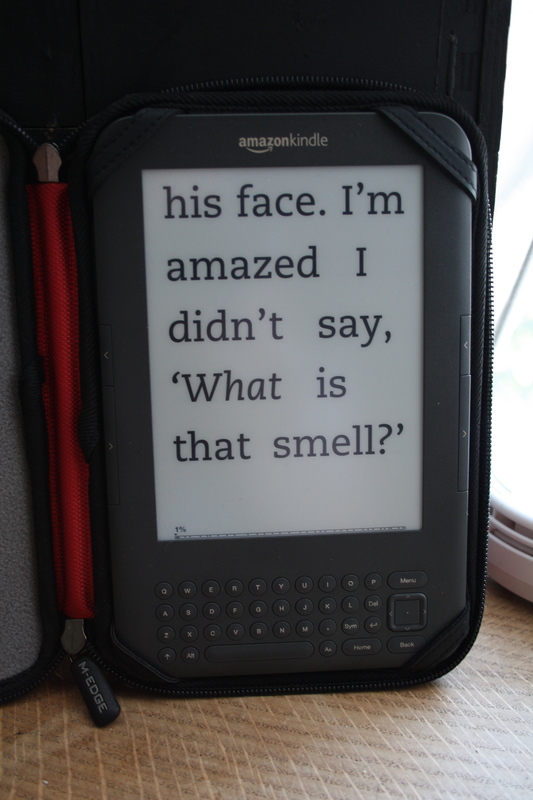 The kindle doesn’t have any of that, it’s very deliberately aimed at recreating the book reading experience. It’s slightly ironic that dedication should result in a desire for pages to turn.